Warner Bros. Home Entertainment has revealed details about the long-awaited “Batman: The Animated Series” complete Blu-ray box-set. 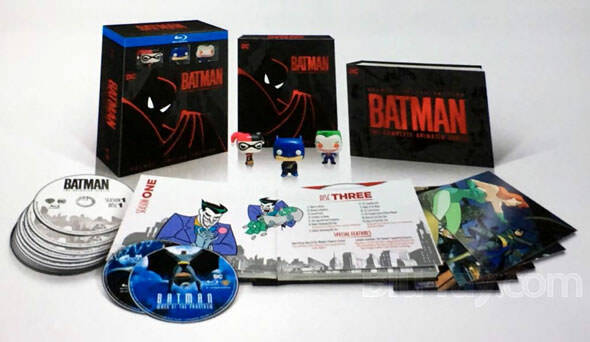 The disc set will include all eighty-five episodes of the highly acclaimed and Emmy-winning series along with the twenty-four episodes of “The New Batman Adventures” and the ‘Mask of the Phantasm’ and ‘Sub-Zero’ movies. The set will consist of new remasters of all episodes and the movies, a new hour-long featurette, audio commentaries, three Funko pops, and a deluxe art book. The set will retail for $112.99 and will be available on Blu-ray on October 16th. Check out the cover art for the set below.